Sauté onion and garlic in butter over medium heat for 5 minutes. Add rice and stir to coat with butter. Transfer rice to a 1-quart glass or metal dish that will fit into a 6- or 8-quart Presto® Pressure Cooker. Add chicken broth to rice mixture. Cover dish tightly with aluminum foil. Make an aluminum foil lifter. * Add 2 cups water to pressure cooker. Place 1-quart dish on cooking rack (or in basket) in cooker. Close pressure cooker cover securely. Place pressure regulator on vent pipe. Cook 8 minutes at 15 pounds pressure. Let pressure drop of its own accord. While pressure cooker is cooling, sauté shrimp and asparagus in olive oil over medium/high heat until shrimp turns pink and asparagus is tender crisp. Open pressure cooker and carefully remove dish. 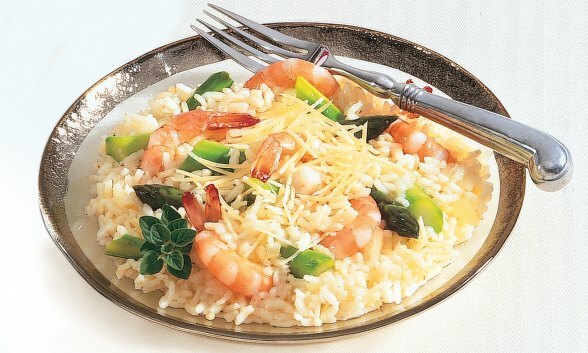 Add shrimp and asparagus to rice mixture. Stir well. Season to taste. Serve with freshly grated Parmesan cheese. Watch Chef Kevin Belton prepare Shrimp and Asparagus Risotto in this video. To aid in placing and removing bowls or pans in a pressure cooker, try this easy tip for making a “lifter.” Pull out a piece of aluminum foil that will fit all the way around the bowl plus about 8 inches more. It should be long enough to fit under the bottom of the bowl and to provide handles on each side for lifting. Fold the foil lengthwise until it is about 3 inches wide. Position under bowl and gently fold down handles. The “lifter” will enable you to lower the filled bowl into the pressure cooker and to easily remove it after cooking.